Enjoy this healthy vegetarian and vegan Indian food recipe of mung dal. Mung dal, sometimes spelled "moong dal," or Indian-flavored yellow lentils, are a traditional vegetarian Indian recipe. This easy version of mung dhal soup simmers the dal in vegetable broth, turmeric, and cayenne for a spicy and flavorful—yet simple—vegetarian Indian lentil dal dish. Moong dal lentils are much quicker to cook than beans—and even regular lentils—when cooking from scratch since they're so tiny, and, as an added benefit, lentils are ridiculously cheap (you can usually buy them in the bulk foods section) and are a great source of protein for vegetarians and vegans. Yellow lentil dal isn't quite a full meal on its own, but it can be a light dinner when paired with steamed white rice (or another whole grain, if you prefer). You can store the leftovers in individual serving-sized containers to take into the office to heat up for lunch, paired with a small green salad instead of rice. Worried about fat? Omit the oil and heat the onion and spices in a non-stick pan with a touch of water instead to make this recipe virtually fat-free and reduced in calories too. This recipe is vegetarian, vegan, and gluten-free (check your ingredients to be 100% sure, particularly the vegetable broth and spices). 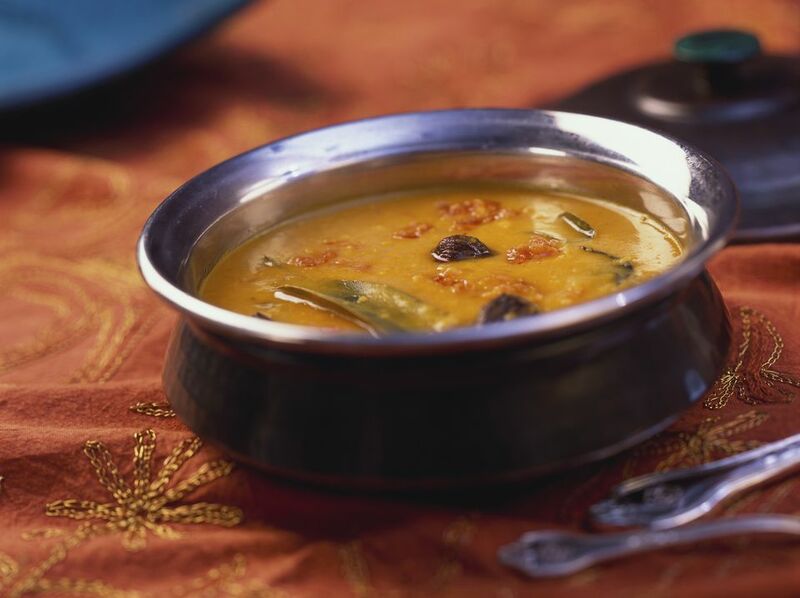 In a large soup or stock pan, combine the mung dal or yellow lentils, vegetable broth, turmeric, cayenne, and salt. Bring to a slow simmer. Cover partially with a lid and allow to cook for at least 20 minutes, and up to 30 to 40 minutes if you prefer a smoother dal. You can add a bit more liquid if needed. In a separate skillet, saute the onion, cumin seeds, and clove in margarine or olive oil for just a few minutes, until onions are soft. Add the onions and spices to the mung dal or lentils and allow to simmer for a few more minutes, stirring well to combine. Sprinkle with a dash of black pepper and add extra salt to taste, if needed. Serve plain, as soup, or over rice. Dal tends to thicken up a bit as it cools, so you may want to add a bit more water if you are planning on having leftovers, but there's also a bit of personal preference involved with just how thin or how thick you prefer your dal to be.